Sen. Mazie Hirono (D-CA) is one of Brett Kavanaugh’s staunchest opponents on the Senate Judiciary Committee. She is forming the point of the lance in the attempt to kill the nomination of an eminently qualified judge to the Supreme Court. They don’t like him. They’re still sour over Merrick Garland. And Democrats they view the latest allegation against him, where he’s accused by Christine Blasey Ford of an attempted sexual assault at a house party some 30-plus years ago while in high school, as a way to boost their 2018 midterm chances. It’s not about the truth. It’s about delaying, getting the base animated, and hopefully retaking both chambers of Congress without really peering through the veracity of this charge. It doesn’t matter to Democrats. If truth mattered to them, they’d be Republicans. The Left wants the FBI to investigate. There’s no federal crime here. This is a political issue, which for once the FBI said they’re not going to touch. This is an unprovable allegation with zero evidence that’s being used to take down nominees some people don’t like, while also weaponizing the FBI to help them deliver the finishing blows in this probable political hit job. That’s the Democrat for you—the same folks who tout how they’re defending the institutional integrity of the country. But Mazie admitted to something quite remarkable to CNN’s Jake Tapper. In short, Brett Kavanaugh shouldn’t be believed nor have the same right to due process of law…because he might overturn Roe v. Wade. Actually, it’s more of he’s a conservative, I don’t agree with his opinions, and therefore he might be guilty of this shoddy, evidence-free allegation that no one seems to remember, even Ford’s friend and third witness, Leland Keyser said that she does not recollect being at any party or gathering where Kavanaugh was present, with or without Ms. Ford, and that she doesn’t even know him. Judge Kavanaugh has denied it of course. There are no corroborative witnesses. Ford can’t remember how the party came about, whose house it was held in, and how she got there. The credibility of this story is shot—literally. But back to Hirono, CNN’s Jake Tapper was quite direct in his questioning. “Doesn’t Kavanaugh have the same presumption of innocence as anyone else in America?” he asked. “I put his denial in the context of everything that I know about him in terms of how he approaches his cases,” responded Hirono, which is a fancy way of saying nope. 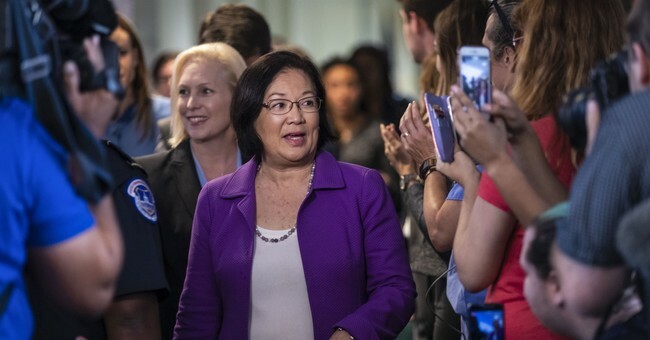 “It seems like you’re saying because you don’t trust him on policy—and because you don’t believe him when he says for instance, he does not have an opinion on Roe v. Wade, you don’t believe him about this allegation about what happened at this party in 1982,” said Tapper after Hirono gave a long-winded answer, which you can just watch in the clip above. “This is why its so important there at least be an investigation, so that there’s some effort at collaboration,” she replied. Well, there won’t be an FBI investigation, which seems to be what she’s referring to because, as Senate Judiciary Committee Chairman Chuck Grassely (R-IA) noted, the committee cannot just dragoon an executive agencyto do their work for them. The judiciary committee is more than capable of peeling the layers to this allegation, which so far look very, very thin in terms of veracity. Every single person should watch that clip of Hirono. Just astounding. They know this is a smear and a game. They don’t care. Conservative jurists don't have the same rights as others, apparently. Please keep putting this woman in front of the cameras. Also, didn’t you just tell men to shut up, Mazie? And you don’t know what illegal immigration is, so please stop touting your qualifications when it comes to assessing judges. You’re against him because he’s conservative, though as some have noted, as deplorable as this statement is, you might have shed light on the Left’s playbook here: only Democrats deserve a right to due process of law. Also, don't ask her about fellow Democrat Keith Ellison. It undercuts the narrative.